Did you know that you could be owed £1,700? Like millions of other people in the UK, you could be due a PPI refund. Here at Canary Claims, we know how much people can receive after a successful PPI claim. But many people don’t realise just how much they could be entitled to. We asked over 1,000 people and discovered that almost 90% were unaware of the average claim amount. According to the Financial Conduct Authority, the average PPI claimant receives a staggering £1,700 from their bank. Only 12% of those asked believed that this was the rightful amount. While this is the average amount, thousands of people have been given significantly more from their bank. If you were mis-sold PPI on multiple accounts, you could be due even more money. What’s more, if you have previously made an unsuccessful claim, you may be able to claim again. Read below to find out how — along with some ideas about what you could do with £1,700 from a successful PPI claim. Do You Know What You Can Buy With £1,700? 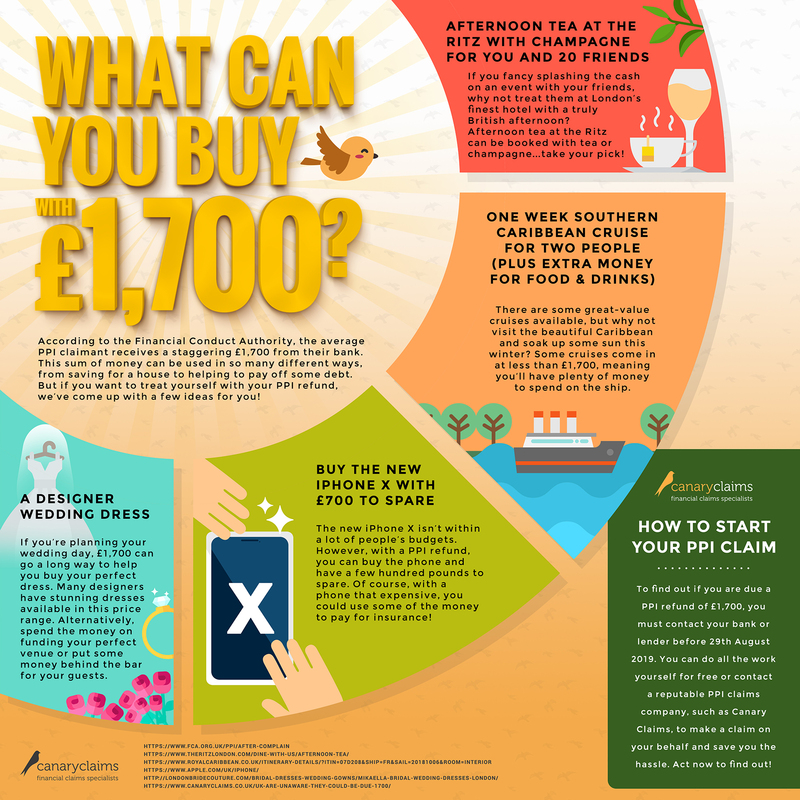 If you can’t picture what £1,700 looks like or can’t decide what you would do with that kind of money, we’ve come up with a few ideas for you! Afternoon tea at the Ritz costs £76 per person with champagne. So if you’re feeling particularly generous with your PPI refund, you could treat your nearest and dearest to an afternoon of sandwiches, cakes and bubbly at London’s finest hotel. How does a cruise in the Caribbean sound? If that sounds like paradise, you can afford paradise following your successful PPI claim. This trip comes in below the £1,700 payout so you’ll have money left to spend on the cruise too. Winner! The latest iPhone is far too expensive for most of us without a PPI refund. Prices start at £999 with features never before seen on an iPhone. For some people, it’s a must-have device. If you select a 64GB iPhone X you’ll be left with £700, which no doubt you could probably buy a gold case with — the perfect compliment to your snazzy new phone! If your big day is coming up then using the money to fund the wedding of your dreams is a great investment. Each element of a wedding can be costly, but if you’ve got the cash, why not splash out on a fabulous designer dress? There are some stunning dresses available around the £1,700 price tag. If you’re eager to receive £1,700 (or potentially more) from your bank or lender for mis-sold PPI, it’s not too late to make your claim. However, you must make your claim before 29th August 2019 as this is the official deadline for all PPI claims. At Canary Claims, we’ve put together a guide on how to claim PPI. Even if you don’t have your paperwork, we can still make a claim for you. We also offer a no win, no fee policy [Cancellation charges may apply only if the claim is cancelled after the 14 days cooling off period. 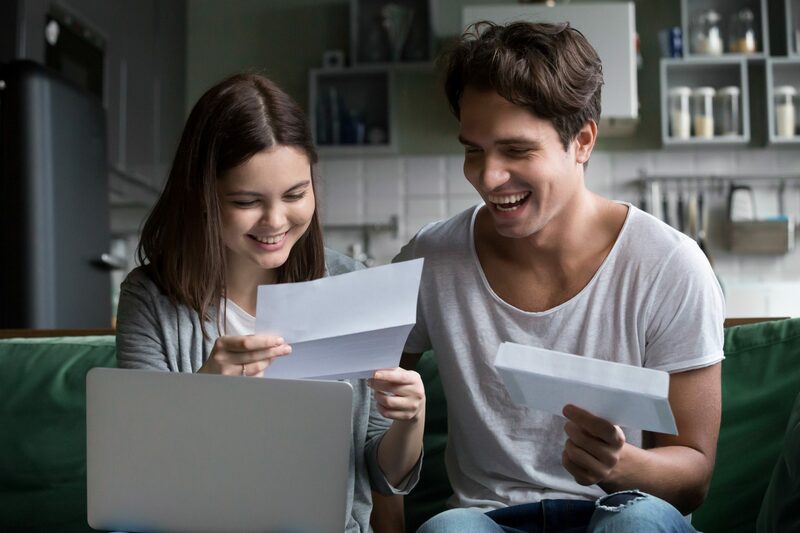 The fee would be based on the work done at the time of cancelling at a rate of £120 per hour and up to a maximum total of £180], which means you will only pay us if your claim is successful! What do you have to lose? If you have previously made a claim that wasn’t successful, we can claim for you again under the Plevin ruling. This means you may be due a refund if the commission on your PPI sale was over 50%. This new rule has allowed thousands more people to claim a refund, with the average commission on PPI sales being 67%. There is no reason to delay. In a few month’s time, you could be nearly £2,000 better off. Even if you’re not sure if you’re entitled to reclaim PPI, it’s worth making a claim just to check. Do you want to know if you are due £1,700? Use our PPI claims calculator to find out how much you could receive from a PPI refund.